What Cutting Edge Options Will Make My Event Unforgettable? These features may not be offered by every photo booth rental company. However, you should be aware of them because they can help you personalize your event, and add that special touch that makes it unforgettable! • Your event is certain to go viral when enabled with Social Media Sharing. 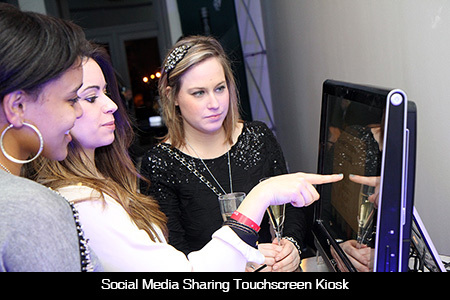 A social kiosk is the ultimate way to make everyone who couldn’t attend jealous when they see how much fun your guests are having. • Some companies offer social sharing on the booth itself, but we encourage an external sharing kiosk for anything more than sending photos to email. • A kiosk away from the booth will make sure each guest can have plenty of time to post images to social networks like Facebook, Twitter, Pinterest or send by email and text message. • For most events you’d like the booth to be set up before your guests arrive at the start of your event, but you don’t want the booth hours you’re paying for to be used up while you wait for guests to arrive. Idle time is the perfect answer to this problem. • Idle time (also called Idle Hours) is a period where the photo booth is set up, but not actively in operation. The time is offered at a price lower than an active rental hour. You can get the most value out of your photo booth rental, by scheduling your active hours for time when your guests are able to take full advantage of enjoying the booth. • You can add an idle hour at the beginning of your event and in the middle during dinner, and get the benefits of a 6 hour rental with the price of a 4 hour rental. • Idle hours are offered so you can squeeze every drop of value from your photo booth rental, so don’t hesitate ask if you can break the idle time up into half-hours, or 15 minute increments. • In addition to having the option to take photos, some companies have invested in booths that can also record videos with sound that will be provided to you on a flash drive or DVD following the event. • The videos are generally anywhere up to 30 seconds in length, and are great for creating a visual guestbook, or capturing testimonials. • An additional bonus of professional DSLR cameras is that newer models can record your guest’s video footage in full High Definition quality, so it will look amazing on any screen from a cell phone to your home theater system. • It’s hilarious to watch people run from the photo booth so they can catch their 15 seconds of fame on the big screen! Add an HD Projector and large format screen to show your guest’s photos to the entire event in real time. • Most photo booth rental companies offer a small external monitor that shows guests standing outside of a curtain style booth what’s going on inside. An HD projector takes this to the next level by showcasing the photo booth experience to everyone in attendance. • Imagine your guests superimposed on a beach, in a stadium or driving a car… any or all of those are possible at the same event! When you add a green screen to your photo booth rental, the green backdrop is automatically replaced in the printed photo by a pre-selected background graphic. • Companies with a sophisticated green screen setup will have a ‘live view’ on the screen where guests can see the backdrop graphic as if it’s already been replaced in the photo and position themselves in their virtual surroundings. • For an extra visual effect, you can superimpose a graphic on top of the final photo including text, logos, or anything that you can dream of.